This Program was the pioneer permit coordination program in California, established in 1998 to reduce barriers to agricultural resource conservation projects in the Elkhorn Slough Watershed in northern Monterey County. The program, spear-headed by NRCS, RCDMC and Sustainable Conservation, streamlined the permitting process for land managers working with the NRCS or RCD on projects utilizing 10 approved conservation practices. It paved the way for many similar RCD-led programs throughout California ever since. Program outcomes were summarized in the Elkhorn Permit Coordination Report. From 2007 to 2012, RCD of Monterey County partnered with neighboring RCDs and Ecology Action in the Livestock & Land Program, which provided education and technical and financial assistance to livestock managers’ efforts to manage drainage, mud, vegetation and manure in areas of concentrated livestock for water quality and animal health. Through the Livestock and Land Program, the RCD actively recruited and trained livestock owners on implementation of Best Management Practices (BMPs) to accomplish goals for water quality improvement. The goal of the program was to achieve immediate and lasting reductions in pollution to surface and ground waters through voluntary implementation of BMPs on livestock facilities in Monterey County. It provided assistance to livestock property owners in implementing and understanding BMPs through: funding for land improvements; free site visits and consultations; workshops and training; and publications and brochures. 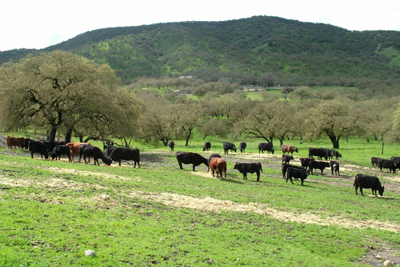 Resource Conservation Districts and Ecology Action continue the Livestock & Land Program in various parts of California together with ranchers, farmers, private property owners, educators, non-profits, community organizations, local governments and many others. Transformation of volumes of assessment information and prioritization and planning to update the Carmel River Watershed Assessment and Action Plan. The Carmel River Watershed Conservancy, Monterey Peninsula Water Management District, Planning & Conservation League Foundation, Monterey Peninsula Regional Parks District, Carmel River Steelhead Association, Big Sur Land Trust, State Coastal Conservancy, CA Dept. of Fish & Wildlife, NOAA National Marine Fisheries Service, USDA Natural Resources Conservation Service, US Fish & Wildlife Service, the County of Monterey (Public Works and Water Resources), Cal State University at Monterey Bay. For more information on the program, contact RCDMC. 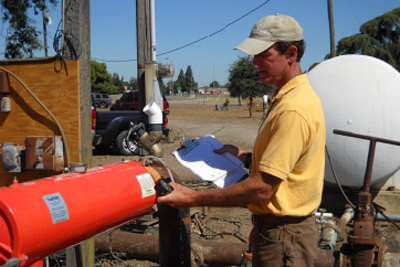 In 2013, three Central Coast regions (Salinas Valley, Pajaro Valley, and Santa Maria) received State Water Resource Control Board (SWRCB) funding support through Proposition 84 grants for local irrigation and nutrient management technical assistance and projects. The grant funded projects had two primary goals, 1) to increase the application efficiency of irrigation water and nutrients through direct work with growers and their organizations, and 2) to install treatment structures to remove excess nutrients from farm field runoff. In Monterey County, University of California Cooperative Extension (UCCE) and the Resource Conservation District of Monterey County (RCDMC) worked directly with growers in the Salinas Valley and assisted them in increasing water application efficiency by 10%-40% and nutrient application efficiency by up to 30%, resulting in substantial savings on fertilizer cost and reduced nitrate load entering the watersheds. The grant team, which included the Central Coast Wetlands Group (CCWG) and Monterey Bay Sanctuary Foundation (MBSF), also accomplished multiple structural projects to remove nutrients from runoff prior to entry into local waterways. These projects included a treatment wetland (PG&E Constructed Treatment Wetland), two woodchip bioreactors (Oceanmist and Azevedo), a sediment retention basin for a vegetated ditch (Spence Vegetated Treatment System), and a California Irrigation Management Information System (CIMIS) station (Soledad CIMIS Station). Project Summary: Three types of Irrigation and Nutrient Management assessments were offered including Distribution Uniformity (DU), Irrigation Scheduling, and Nutrient Management. There were a total of 18 DU evaluations (13 drip, 5 sprinkler irrigation systems), with 75% of recommendations implemented. 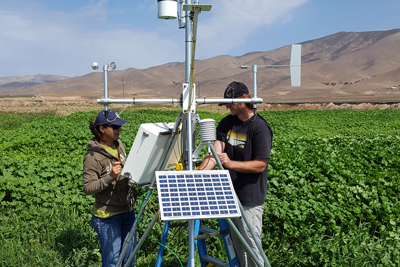 Together, UCCE and RCDMC conducted 28 irrigation and nutrient management assessments for 12 growers resulting in an estimated water savings to the Lower Salinas Valley of 2704 acre-ft/yr and a fertilizer reduction of 211 tons N/yr. Project Summary: The Soledad CIMIS Station, located between the Salinas and Arroyo Seco stations, will provide localized Evapotranspiration (ET0 ) data to help growers’ determine crop water needs for farms representing approximately 60,000 acres of irrigated agriculture in Salinas Valley between Gonzalez and Greenfield. Data is sent on an hourly basis to the CIMIS website, where ET0 data can be accessed: www.cimis.water.ca.gov/ and is incorporated into decision support tools, such as CropManage, for use by growers and irrigators. 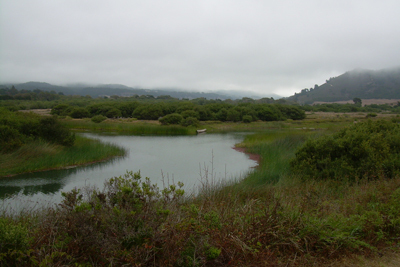 Project Summary:The PG&E treatment wetland covers 18 acres of land in the Moro Cojo watershed. It is designed to reduce nutrients and other potential pollutants, provide wildlife habitat, and help with flood control. Inlet water is pumped from the Castroville Ditch which drains approximately 800 acres of land farmed predominantly in artichokes and brussel sprouts, as well as a portion of the stormwater runoff from Castroville. Water is gravity-fed through a 1.25 km sinuous channel that includes depressions and ponds that support wetland plants and sediments that denitrify agricultural water. The treated water then flows into the Castroville Slough about 200m downstream of the inlet, and out to the Moro Cojo Slough before joining Old Salinas River and flowing into the Pacific at Moss Landing Harbor. 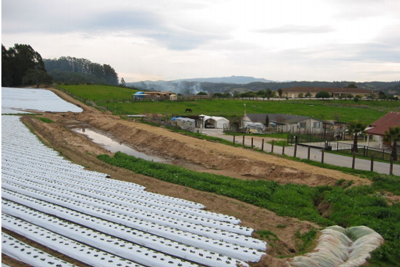 Project Summary: The Oceanmist bioreactor is situated on 0.5 acres of marginal land to treat runoff from approximately 100 acres of farmland that is dedicated to predominantly artichokes and brussel sprouts. The bioreactor has a wetted treatment area of 7500 ft2 and receives and treats runoff from three agriculture drainage ditches that support extensive tile drain systems for a capacity of 30,000-144,000 gallons per day. A sinuated channel was created to minimize bypass within the system and simulate plug flow conditions. The channel was excavated and lined with pond liner to create a containment basin, and then filled with woodchips from the local landfill. 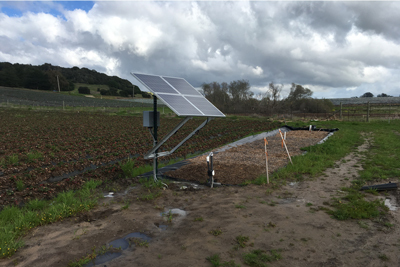 Project Summary: The Azevedo bioreactor treats runoff from 10 acres of strawberry fields on the Azevedo Ranch adjacent to Elkhorn Slough. Irrigation and storm water runoff from the strawberry fields travels down farm roads and into a sediment basin where heavier sand particles settle out. Water is actively pumped into the bioreactor inlet from a floating pump powered by a solar panel and battery pack. 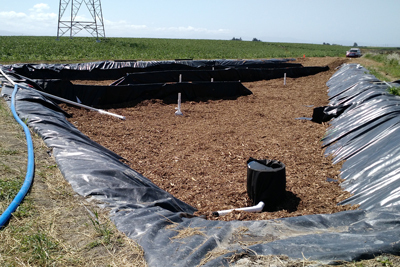 The bioreactor is a plastic-lined basin filled with woodchips purchased at the local waste disposal facility. The bioreactor is designed to treat up to 4300 gallons per day with a hydraulic retention time of 25 hours. 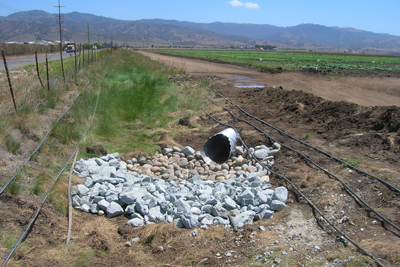 Project Summary: The Spence Vegetated Treatment System (VTS) is located at USDA Agricultural Research Station in the Quail Creek watershed south of Salinas. It is an 1800-ft long ditch vegetated with native grass (red fescue) that intercepts runoff from 86 acres of farm fields, removing nutrients and other pollutants. 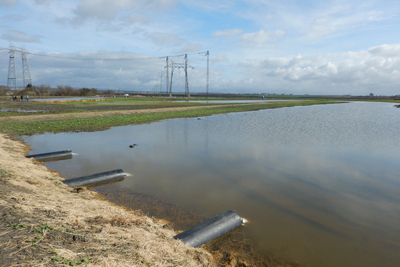 The project installed sediment traps at the field outlets to the VTS to enhance the VTS function and lifespan. The VTS is used as a demonstration site for researchers including UC Davis Granite Canyon Lab, agricultural professionals and growers interested in nutrient and pesticide removal by vegetated ditches.